Once at my grandparents, I headed down over the hill to pick some blueberries. Sandy ran around the garden looking for a rabbit or a deer to chase. 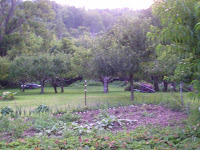 In the distance I could hear the sounds of a someone cutting their grass, the low hum of the mower. Closing my eyes I listened to the soothing sounds of Mother Nature. The wind gently rustling through the trees, lifting and fluttering the leaves in the breeze. The acoustical timbre of the cicada song, occasionally punctured by the laugh of a child riding their bike or running through a nearby backyard. Twilight is a beautiful time in the country. Tonight the sky melted into various pastel shades while the clouds lazily floated by. 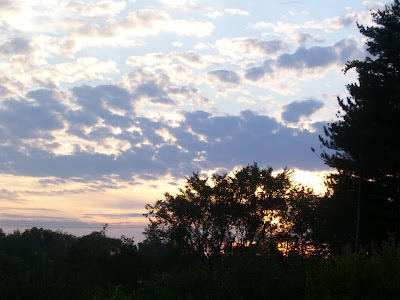 Sandy and I settled on to the back deck to just drink in the sight of the sun setting over the hills and watched as fireflies danced along the treeline, putting on a spectacular show timed to the sounds of the evening. Just relaxing and appreciating the beauty around me as a perfect summer evening. Gorgeous pics! ANd yes, I agree the nature is a very nice place to relax and find "you" time. That's why I do some escapades to the beach from time to time (we're like 20 minutes away). this looks so peaceful. one thing i miss living in a big city. I have always been a city lovin' girl. Joshua and I went for a drive in the country (not much left around here) I fell in love. So peaceful and green. This weekend we are going to my parents cabin in eastern washington. No running water or plumbing. I'm actually looking forward to the peace. Thanks for sharing. THANK YOU. I'm reading this from my desk at work at 7:45 at night and this just helped me to unwind and pretend that I'm smelling the country air too. I wish I was. P.S. 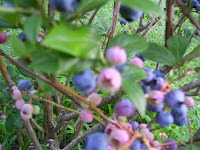 So funny that I did a blueberry tart post the day you pick blueberries! Wish you could send me some. Andy--yes, the beach works as well. Chickbug--yes, but you get sunsets behind the skyline, which are beautiful as well. RebeccaC--I find it amusing that we both had blueberries on the brain as well too. AND working at 7:45 at night....I feel for you! Wow those pictures are so beautiful. 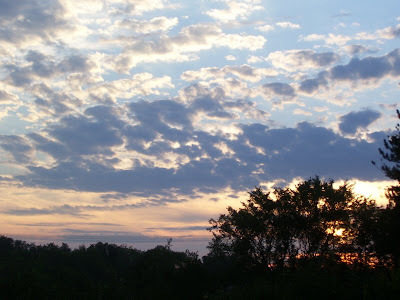 I LOVE the sky picture, so gorgeous. I miss those views in the city sometimes. These photos are gorgeous! I can't believe that sky.